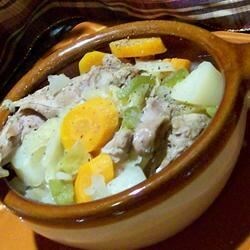 "This stew recipe is for those of us who are hunters and are more of the country ilk. It is easy that you can go to work while it simmers in your pot and when you return home, dinner is ready." This has potential, but I felt it was a little bland. It needed more seasoning, possibly some fresh garlic and more salt and pepper. Y'all should try this! The hard part is skinning it, but once that's done, its easy as apple pie! this is the same receipe my mama always used when we were kids. i think i'll make her a pot!!! thanks!! EXCELLENT! It takes a veeeeeerrrrrrry long time to cook, but is worth it! My friend Barb made this for our hunting pot-luck, we all had to have it. Wonderful!